The term "mixed bag" is quite overused, but it's a good way to describe Hell In A Cell. There was plenty of good on the night, but a major gaffe was possibly enough to ruin the show (much more on that later). Not only did Raw get the final two matches on the card, but the WWE title match was fourth from last, meaning it was 'just another match'. AJ Styles and Samoa Joe deserve much better than that. Not only was this match in the middle of the card, but it wasn't even the final Smackdown match of the night (that honor went to the pointless mixed tag match). In my opinion, Smackdown is by far and away the much better show, yet the two most exciting matches for me (the other being Becky vs Charlotte) took place in the first half of the pay-per-view. To some, the match placement on the card may not matter too much, but it is a pretty big deal. In a rivalry born from a broken friendship, Becky Lynch finally achieved her goal of regaining the Smackdown Women's title. It was a good match that saw the Irish Lass Kicker have an answer for nearly everything Charlotte threw at her. In a match with Lynch doing everything in her power to work over the champion's left arm, she won the title off of a DDT to counter Charlotte's Spear. Lynch celebrated (with the crowd on her side) while Charlotte looked defeated (get it? Since she was literally defeated in the match). Flair offered to raise the new champ's hand out of respect but Becky refused, and held up the title while saying "you're not going to steal my moment", and walked out. What. A. Match. This bout consisted of plenty of stiff strikes and out-of-the-ring action, but it ended in quite a screwy fashion. After a heavy back and forth match (which included bloodshed from Styles), Samoa Joe locked in the Coquina Clutch before Styles rolled him up. At the count of two, the champion tapped out, but the referee failed to see it, and counted Joe's shoulders down for the three count. Just... wow. Roman Reigns and Braun Strowman went head to head in a match that involved plenty of back and forth action, and loads of weapons. Strowman was speared through a table, and McIntyre, Ziggler, Ambrose, and Rollins got involved. A rather exciting spot involved Seth Rollins and Dolph Ziggler knocking each other off of the cell, and through the announce tables. 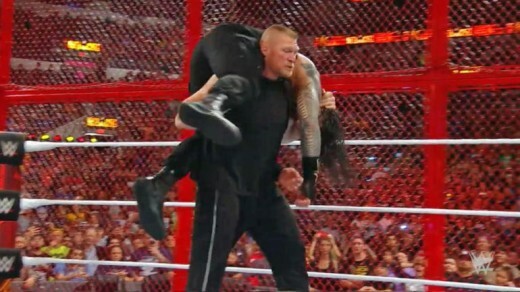 With everybody down, Brock Lesnar's music hit and he kicked the cell door down to cause more mayhem. After Paul Heyman maced (special referee) Mick Foley, Lesnar beat both Reigns and Strowman down with pieces of the broken table, before hitting the F-5 on both men, and leaving. A new ref came in to stop the match because "neither man could continue" as the show ended. This ending angers me to no end. The fact that this match was hyped up so much, just to be thrown away by a finish like this shows how arrogant the company is. It is a slap in the face of the fans to say that after the hellacious match Braun and Roman went through, a single F-5 rendered them "unable to continue". To me, this ending legitimately ruined a pretty good pay-per-view, and it's unforgivable. 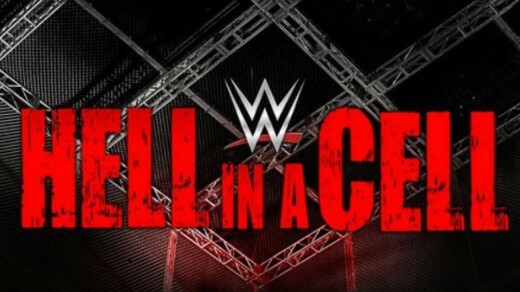 What grade would you give Hell In A Cell? Thank you very much for reading! Let me know, do you agree or disagree with my points? Do you have any other takeaways from the show? Be sure to let me know!